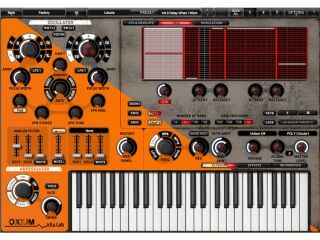 Famed for its software recreations of some rare synth classics, XILS-Lab now promises a performance synth like no other in the shape of Oxium. A stripped back UI means that operation should be simple, while the instrument boasts a powerful eight-oscillator shape engine, two different filters and a unique sequencer modulator. You can grab the 64-bit and 32-bit demo for Mac and PC over at the XILS-Lab website. Oxium can be purchased for €69. · 2 Cumulative analog modelled Oscillators ( up to 8 per patch ). PWM for all waveforms ( Aliasing-free Saw, Triangle, Pulse and Square ) . Advanced Glide/Portamento mode per Oscillator/ Hard Sync and Ring modulation between Oscillators. · 3rd GenerationZero-Delay-Feedbackfilters, self resonance for all modes ( LP 24/12, BP6/12, HP) Additional second filter to choose between Formant Filter, LP , BP, HP with emphasis or articulation parameter. · 3 freely assignable DsyncADSR envelopes. · Exclusive 2nd generation Le Masque controller modulator, with 16 freely drawable zones ( masks). Each mask has two level parameters, can trigger envelopes, or be envelope controlled, the grid has vertical and horizontal snap modes. Patterns can be saved, loaded. 3 Trigger modes. · Central Modulation Environment : 6 freely assignable pairs of source/target parameters, 3 additional prewired pairs for common musical gestures ( Vibrato, Tremolo, Autowha ), 6 hardwired slots for real time controlers ( Mod Wheel, Pitch Bend, Aftertouch, Breath Controller. All parameters are Midi Controllable. · Deep integration and interaction between Play modes, Arpegiattor modes, modulations and per voice core sound engine for organic and expressive instruments. · Instant Visual Feedback User Interface Concept based on exclusive Flower Design of Oscillators , LFOs, Filters and Glide blocks for Instant Visual Feedback of synthesizer modules. · Exclusive Intelligent Feedback Pane : You'll find here all the informations useful to understand, then modify or adapt a preset to context. · Database : Double Criteria Search Engine : Find the right patch for your track in seconds, build your own favorites soundbanks, project, CD or Live soundbanks, and export them with a single click. Cross platform preset format.